Henry “Harry” Horton was born in England in 1870, spending his early years in Tunstall, Staffordshire. He immigrated to the United States with his grandparents in 1884. As an adult, Harry made his home in Bingham County, Idaho. There he met his future bride, Vesta Wright. She had been born in 1873 in Logan, Utah. A Baptist minister performed the marriage of Harry Horton and Vesta Wright on 30 April 1896, in Blackfoot, Idaho. By 1899 they had grown to be a family of four, with the births of sons Leo, then Ralph. Daughter Rebecca joined them in 1905. Their fourth child, John, was born and died in 1907. Harry was a stock grower, butcher, and shopkeeper who plied his trade in Pocatello, Idaho; Dillon, Montana; and Butte, Montana before arriving in Miles City in about 1906. When the Hortons arrived in Miles City, Harry wasted no time opening a butcher shop at 103 South Montana Avenue, which he named the Central Meat Market. By 1910, they were making plans to build an elegant new home to be located at 1918 Main Street, right next door to the George and Margaret Foster family, from whom they bought their building lot. They hired C.S. Haire and J.G. Link as architects for the project, with construction beginning in 1911. 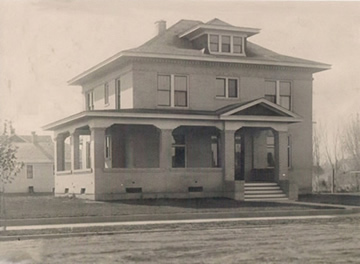 The home was completed in 1912. The Hortons lived the remainder of their lives in their stately home on Main Street. All three of their children graduated from Custer County High School. All successfully pursued higher education and careers in the east. Vesta died in 1959, and Harry died in 1964. They are both buried in the Custer County Cemetery.